← Hot Air Balloons and Green Chile Stew Time in Albuquerque – What a Gas ! A Vintage Cookbookery Mystery: Will the “Cookbook Queen” meet Chef Robert Irvine? CLICK ABOVE TO PLAY BACKGROUND ! I didn’t designate myself as “The Cookbook Queen”. Rather, an acquaintance did, after seeing an article about my cookbook collection (and 2013 holder of the Guinness World Record for cookbooks), in the Albuquerque Journal, in 2013. Somehow, though, the name just stuck. hot air is gone (read: Balloon Fiesta is over). 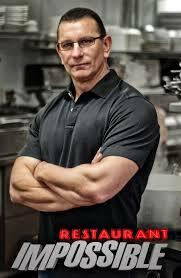 Renowned Chef, Robert Irvine, is coming to town next week to save a local restaurant, which will be featured early next year on his popular show, “Restaurant Impossible“. After trying once before to get in on the action last year, when he saved another local establishment, I am pleased to announce that I will be one of the bevy of local minions to do as Chef Irvine beckons. Will he shout at me? Will I cower when he yells “everything out of here…NOW!” Will I even see him? Will he autograph a couple of his cookbooks, which I have in my collection? Dare I even ask? If I invited him to come over and see my 4,577 cookbooks, would he think me a fruitcake? Well, I’ll probably be relegated to one of the many horrific tasks you may have seen on “Restaurant Impossible“, like moving dirty booths and peeling dead rats off of the floor, or scraping 3 inches of caked-on grease from the fryer, or maybe running from the cockroaches streaming from behind the refrigerator? Time will tell. Stay tuned! “No, no….keep that Cookbook Queen away from me!” (Photo Credit: www. This entry was posted in Cookbooks, Cooking, Cooking Technology, Food Trends, Guinness World Records, Restaurant Menus, Uncategorized and tagged "Restaurant Impossible", Albuquerque, Chef Robert Irvine, cookbooks, Cooking, Food Network, Guinness World Record, New Mexico, Restaurant Makeovers, Southwest, Sue Jimenez. Bookmark the permalink.